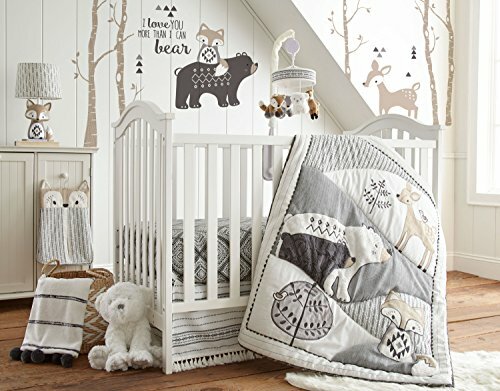 Levtex Baby Night Owl 5-Piece Crib Bedding Set Bring the stillness and lushness of the forest to your little one's nursery with the Levtex Baby Night Owl 5-Piece Crib Bedding Set. The Levtex quilt and fitted crib sheet, with a gray, natural and ivory color combination, make any room trendy and stylish. 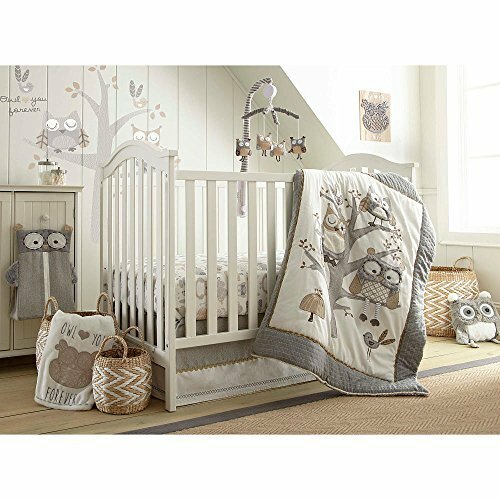 The detailed family of owls, eclectic patterns and large wall decals create a woodsy theme that your tot will love to explore. With the included diaper stacker, you can conveniently stow baby's diapers to keep his or her space organized. 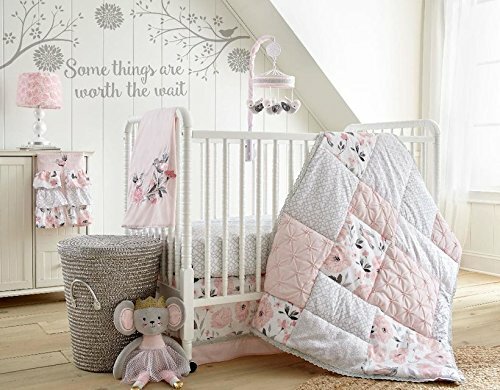 Levtex Baby Willow Pink 5-Piece Crib Bedding Set, Quilt, 100% Cotton Crib Fitted Sheet, 3-tiered Dust Ruffle, Diaper Stacker and Large Wall Decals. 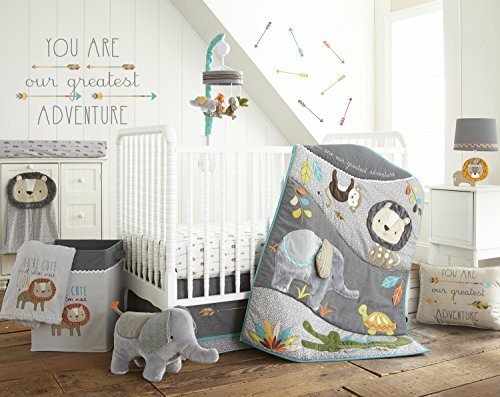 The 5 Piece Crib Bedding Set includes a Quilt, 100% Cotton Crib Fitted Sheet, 3-tiered Dust Ruffle, Diaper Stacker and Large Wall Decals. 45"L x 36"W (quilt), 52"L x 28"W x 9"D (fitted sheet), 16" (dust ruffle). Machine wash cold, gentle cycle, tumble dry low. Wash separately. Do not Bleach. Iron on lowest setting as needed. The Charlotte Nursery Collection features a beautiful vintage inspired floral pattern in cream, coral and aqua with metallic gold accents. The cotton voile tiered dust ruffle is the perfect mix of feminine glamor with a scallop embroidered edge and touch of metallic sparkle throughout. 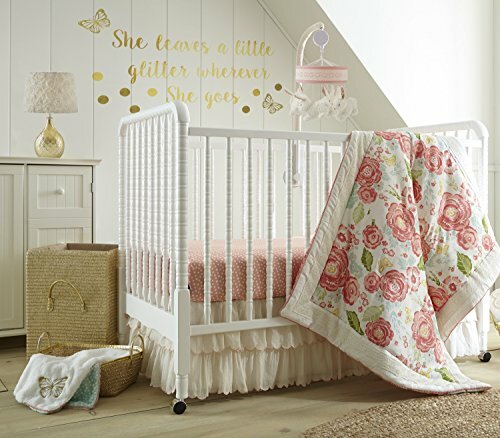 The 5-Piece Crib Bedding Set includes a Quilt, 100% Cotton Coral Dot Crib Fitted Sheet, 100% Cotton Gold Dot Crib Fitted Sheet, Dust Ruffle and metallic gold Wall Decals with the phrase, "She Leave a Little Glitter Wherever She Goes." Features a beautiful vintage inspired floral pattern in cream, coral and aqua with metallic gold accents. Beautiful vintage inspired floral pattern. This Bedding Set makes for the perfect baby shower gift! 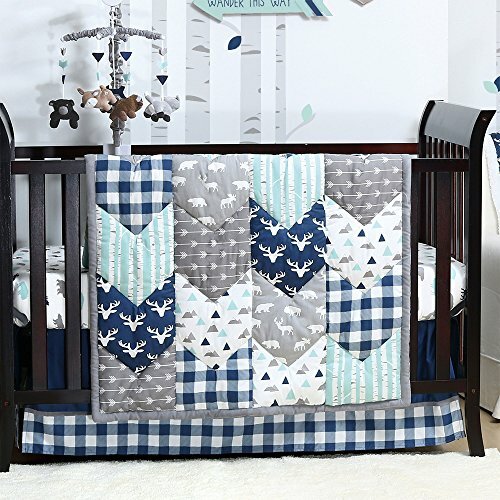 The Peanut Shell Woodland Trail Patchwork 5 Piece Crib Bedding Set features a beautiful 100% cotton sateen chevron patchwork of animals of the Great Plains, buffalo plaid, mountains, arrows, and birch trees. 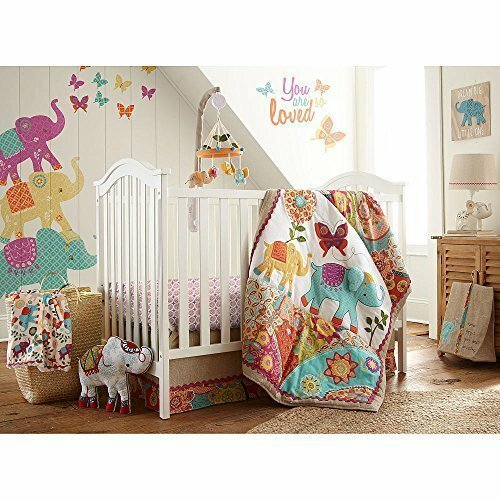 The five piece crib set includes a patchwork quilt, two different coordinating fitted crib sheets, tailored dust ruffle, and digital musical mobile. Let the love sprinkle down with the Little Love by NoJo Happy Little Clouds 5 Piece Infant Bedding Set. 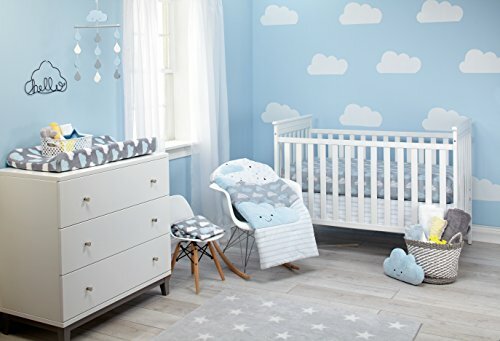 This sweet set features a comforter with appliqued clouds on a pieced background of blue and white stripes, grey and blue raindrops, and blue and white cloud patterns; a white fitted crib sheet with light blue and grey raindrop pattern, a grey fitted crib sheet with light blue and white cloud pattern; a coordinating blue and white striped dust ruffle, and a wire wall art piece that says "Hello". Coordinates with a complete line of Little Love Happy Little Clouds infant bedding and room decor.